Here's a thread for listing all dinosaurs that will appear in Jurassic World Evolution! Some Novel dinosaurs might have a chance, but I'm too tired to figure out which animals. We've made living biological attractions so astounding that they'll capture the imagination of entire planet. Aren't Apatosaurus still confirmed? I don't see them listed on the first post. You're right, I simply forgot they had been in the reveal trailer. The top post has been edited to reflect this. 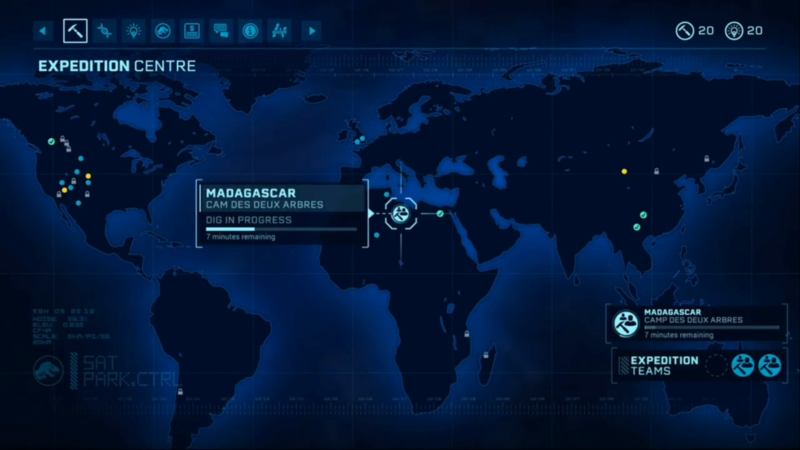 DPFAR: One way to more easily guess what dinosaurs will be added is to look at the world map that shows all of the dig-sites that are in the game (or are at least in their current build). 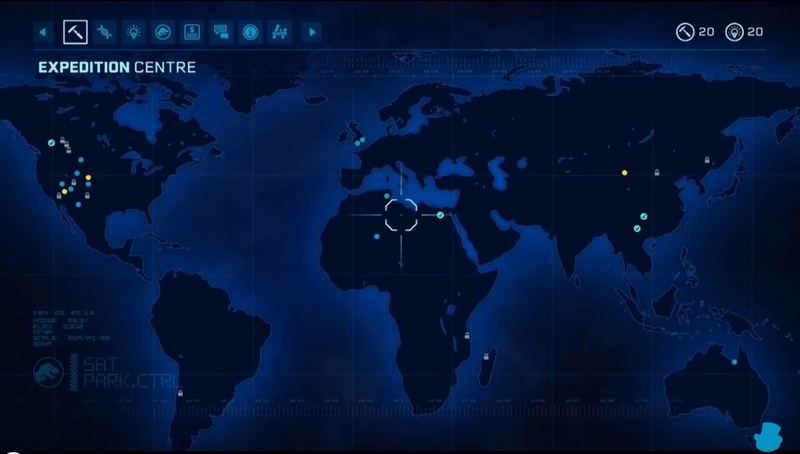 They showed this map and in many ways it appears to be similar to JPOG's digsite system. Below is a screenshot from a Youtube upload of the conference, although if anyone has a better or higher quality version of the image feel free to post it here. After a bit of research and trying to match the various formations to the dots as close as possible, I believe I've definitely located 16 out of the 29 Dig Sites seen in the world map. There are 5 other dig sites that could be possible contenders because of their close proximity to the dots, but I'm unsure about them. I've also listed the potential species that might appear in the game from these Dig Sites, whether they might have a connection to the franchise or could be a great addition to the game. That's a great list! In the following video, the head of animation accidentally confirms Dilophosaurus is in the game. It's at the time-stamp of 16:59. The top post has been updated to include this info. Speaking of videos Bestinslot has uploaded a new video, which features the Dig Site map from the game. But most exciting of all, there is a 30th dig site and it's located in Queensland, Australia! The Australian dig site for JWE could be the Winton Formation, where dinosaurs such as Australovenator and Diamantinasaurus have been discovered. Considering how the original JP had the one Alamosaurus skeleton, I wonder if the Kirkland/Ojo Alamo Formation will be on the list or not. That one blue dot seems in the rough location of it. I'm also interested if they plan to have the JP3 Spino or the modernized real Spino in this game. I would say probably the film one because there is the risk that some invest in the dino then see the real form and go "WTF, this is not at all what I researched!, this isn't the JP Spino,"
Plus they have other inaccurate dinosaurs so it isn't like real-world authenticity is paramount. Theatrical does seem to be high up on the list though. If that's the case, then would that mean that Universal is intent to keep the JP3 as the 'real' Spino in the JP movie timeline? I'm not so sure about that. I doubt Universal even has any idea of what they want to do with the spino. This game seems to be drawing heavily from JPOG (especially with the digsite map) so I wouldn't be surprised if we see a JP3 spino in game. Personally, I wouldn't mind this at all. With the newly released footage for Fallen Kingdom, I'd say Baryonyx is 100% confirmed to appear in the game as well. Yeah I'd say so too, but I'm waiting for official confirmation from the devs before adding anything new to the list of confirmed species. DPFAR: I've updated the top post with a list of speculatory species we can possibly expect based on the trailer footage for Fallen Kingdom. The Allosaurus looks a lot more like a Gorgosaurus to me. Until we get an official species name, I'm just rolling with what people think it is. Camarasaurus being featured leaves me hopeful that most/all JPOG dinos will be included, which is a very good sign. I would really like for Styracosaurus to make a cameo in the upcoming film so that it's officially canon and guaranteed to make the cut. Otherwise it may, by extension, just be another brought over from JPOG. Beyond JPOG, it appears that Baryonyx and Carnotaurus (ya-hoo!!!) are a given now. Compsognathus needs to be included, and I think that it most likely will be (Compy was originally attempted for inclusion in JPOG, but was nixed before release along with aquatic and flying creatures). A few more that would be really nice to have would be Suchomimus, Mamenchisaurus (film canon), Allosaurus (another from JPOG), and Euoplocephalus. Edit: Also, the scrapped dinos from JPOG such as Yangchuanosaurus, Diplodocus, Iguanodon,etc. Updated to include Stygimoloch and Mosasaurus for the speculatory list since they're confirmed to be in the movie as well. We just got a new trailer that shows a few new species of dinosaurs, including Ceratosaurus! I'm 90% sure that I saw a pair of Corythosaurus as the first species of dinosaur in that trailer. It's awesome to see the Ceratosaurus receive some love!